It's easy to get excited about new programs designed to get kids reading, but sometimes it's not programs, but little things that make a big difference. My fourth-grade son had been looking forward to reading the third book in Rick Riordan's Heroes of Olympus series, so when he found out his elementary school library had received a copy, he rushed to the librarian's desk to check it out. Unfortunately, someone had beaten him to it. The next week he checked back with the librarian, but the book had not been returned. By the third week, he was growing impatient. A sixth-grade teacher happened to overhear his conversation with the librarian, and she offered to loan him a copy from her classroom. He followed her to her room, and as she pulled it off her shelf she remarked, "None of the students in my class have read this yet, so you'll be the first one." He already had his nose in the book when I picked him up from school. So, kudos to Mrs. Hill for going out of her way to loan a brand-new book to a kid she didn't even know simply because he couldn't wait to read it. Sometimes you don't need stickers or an ice-cream sundae party or free tee-shirts, you just need the right book at the right time. 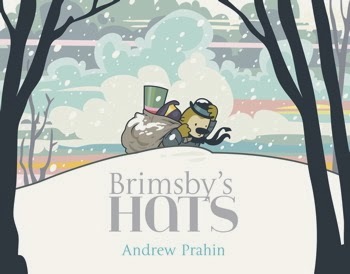 While searching for a book to read for a friendship-themed story time, I was delighted to find Andrew Prahin’s debut picture book, Brimsby’s Hats. This story is not only an endearing tale of friendship, but with its winter setting, it is a perfect fit for a cold February day. Brimsby spends quiet days making hats, drinking tea, and enjoying conversation with his best friend, but when that friend leaves to become a sea captain, the hat maker’s days become too quiet. He sets out “on a long walk, looking for new friends” and finds birds that are too busy to talk to him. Undaunted, Brimsby uses kindness and cleverness to make new friends. What might at first glance threaten to be a predictable plot is anything but, thanks to a generous infusion of whimsy. Birds that shovel snow out of their nests, a conversation about lemon cookies and worms, and Brimsby’s ingenious gifts for his new bird friends are a few of the gentle surprises. While the engaging text tells the story with matter-of-fact ease, it is most remarkable for its restraint. By not over-explaining, Prahin gives the illustrations an equal role in telling the story. Picture-filled speech bubbles show conversation as an exchange of ideas, not just words. And seeing the birds sleeping snugly in warm nests helps readers appreciate the hat maker’s gifts. Prahin’s deft use of color adds depth and emotion. When Brimsby’s friend leaves, the jaunty red disappears, leaving a world of muted color. The search for friends seems all the more lonely as the hat maker walks across a vast expanse of snowy white and gray, and color once again brightens his world when he meets the birds. This is one of those books where the text and the pictures work in flawless harmony. Together they meet in a satisfying conclusion that embraces friendships, both old and new. *I'm not actually sure of the publication date for this book. Simon & Schuster lists it as December 2013, but the copyright printed in the book is 2014. Just a reminder that the winners of the 2013 Cybils Awards will be announced tomorrow morning. Wake up and check them out here. Valentine's Day is just a few days away, thus it is time to pull out all the books that celebrate love, friendship and family. Traditional holiday books are a must for the season, but sometimes it is fun to look outside the box and read something a little bit different. 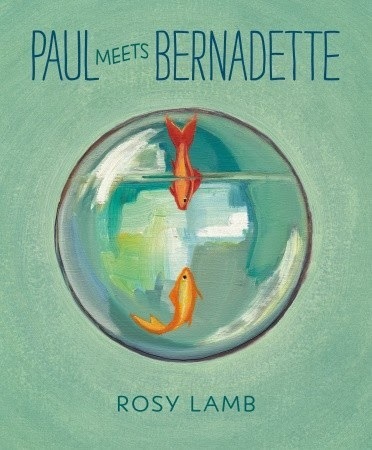 This year, one of my favorite books that beautifully captures that spirit of love is Paul Meets Bernadette by Rosy Lamb. First, meet Paul. He is perfectly happy, all alone in his fish bowl, spending his days swimming in circles. He doesn't know anything else and the inside of his bowl is his entire world - until Bernadette drops in. Bernadette is not content to swim in circles all day, she likes to explore the outside world. She is a fish who knows things and she teaches Paul all about what he has been missing (even though she is charmingly inaccurate in her identifications). As Bernadette points out each new discovery, Paul looks more closely at Bernadette - and likes what he sees. Thick oil illustrations add texture and interest to every page, as each picture pulls you into the fishbowl and you almost see the fish swim around in the water. With each reading, you will discover new details and enjoy the images even more. This is a perfect read-a-loud book for any age and a perfect way to celebrate good friends who make your world better.